A video intended to promote safe cycling behaviour has instead sparked a conversation about just which actions are considered safe. 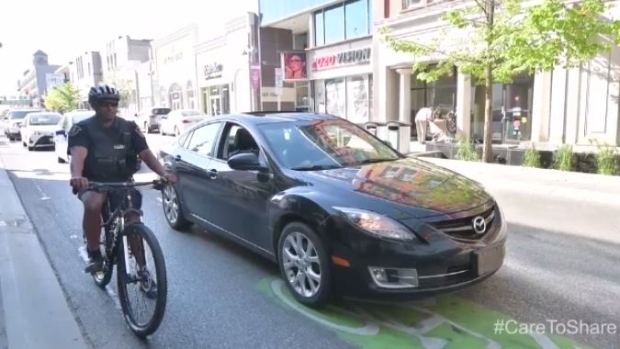 Last week, Waterloo Regional Police released a video meant to address safe biking and offer advice for cyclists. “Ride as far to the right shoulder of the road as possible,” the officer narrating the video says at one point. That piece of advice received scorn from a number of people on social media – particularly because the officer was offering it while next to a sharrow. Sharrows were installed on King Street in downtown Kitchener in 2013. The sharrow denotes that the road is narrow and drivers of cars are meant to share the lane with cyclists, instead of trying to overtake them. “It’s actually almost safer to take the road a lot of the time, and take the middle lane,” says Emily Slofstra, the chair of cycling advocacy group CycleWR. In addition to the sharrows, King Street has signs reminding drivers to share the road and travel single-file with bicycles. “It’s not really a safe place to bike,” she says. Police spokesperson Insp. Mike Haffner says the information in the video was based on the Highway Traffic Act, which police are required to enforce. He describes the sharrows as “an opportunity to make motorists and cyclists aware that this line is shared,” while maintaining that the law sets out that cyclists should still aim to ride as far to the right as they are safely able to. “When cyclists are travelling on the road and travelling at a speed lower than a motor vehicle, the law states that they shall turn out to the right and – most importantly – move as far to the right as practicable, so that faster vehicles can pass them,” he said in an interview. Slofstra says she’s concerned that the video and the sharrows combine to send mixed messages to drivers about where they should expect to encounter cyclists. The police campaign also included a second video, aimed at drivers and offering advice on how cars can effectively share the road with other vehicles. Since 2015, drivers have been required to give one metre of space when passing cyclists on Ontario roadways.